New parents have a long list of items they'll need to purchase before baby arrives. Outside of the crib and the car seat, the next most important purchase parents will make is a stroller. Most new parents tend to register for any stroller they see, assuming that they are all the same. 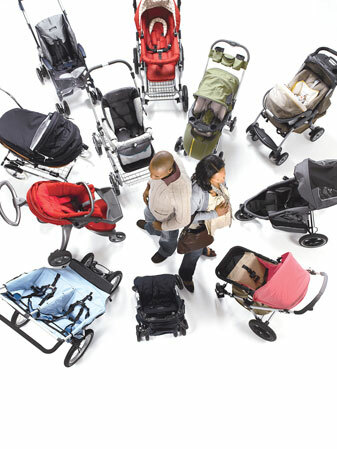 While many strollers may look the same, they are all actually very different and serve different purposes. The most important decision parents must make when registering or purchasing a stroller is deciding what type of stroller best suits their family's lifestyle. There are many different types of strollers on the market today. The most common are travel systems, convertible strollers, jogging strollers, umbrella strollers and prams. Each of these strollers serves a different purpose and some are even versatile enough to be used for more than one. Travel systems tend to be the most common because parents like the fact that they can buy the stroller and the car seat to match. Some of the more popular travel systems are those by Graco, Chicco and Evenflo. Most travel systems offer large storage baskets, snack trays for the baby, cup holders for the baby and parents and handlebar storage compartments for cell phones, MP3 players or wallets. Travel systems also tend to be less expensive and easy to find since they are so popular. While travel systems have many features that appeal to parents, with all of these features comes the added weight. Travel systems tend to be heavier and bulkier, making them difficult transport in and out of the house and car. In addition, they also do not fold as compactly as most parents would like. An option to a travel system is a convertible stroller or a stroller frame. Convertible strollers are sold as a two piece set with a frame and a toddler seat. The car seat is sold separately but usually matches the main stroller seat. Two of the most common are the Mia Moda Atmosferra and Contours. Many popular stroller companies, such as Peg Perego, have also added a stroller frame design to their line. Convertible strollers come with a detachable toddler seat that allows for baby to be turned to face the parent or to face out while riding in it. This is a great advantage for parents because it allows mom to keep an eye on the baby the entire time while out for a stroll. When the stroller is stored in the car, it is easy to load because the frame tends to be very light and the seat is stored separately. This type of stroller is also not as bulky of a stroller because the car seat does not go on top of the toddler seat as with most strollers. It is placed directly into the frame without the need to strap the car seat in. One of the drawbacks to this option is cost and lack of features. Most of the models sold do not have child food trays and tend to be upwards of $200 just for the stroller itself. A much more inexpensive but less versatile option to the convertible stroller is the stroller frame. This version will only suit a car seat and once baby outgrows the car seat, the stroller frame can no longer be used. These frames tend to run less than $50 and are usually a great option for parents that do not know what they want in a stroller. They can use this frame until they decide which stroller best suits their family's needs. This design appeals to parents because it is a smaller, more lightweight option and provides them with less bulk to carry around. Jogging strollers are a great option for busy, on the go families. Jogging strollers are three wheeled strollers that offer a much smoother ride than standard strollers because of the built in suspension systems. One of the most popular brands is the BOB. Some of the pros to buying a jogging stroller as your main stroller is that, since they tend to be double the price of a standard stroller, using it as your main stroller and a jogging stroller will save you some money. If you are the type of family that goes out for runs or spends a lot of time outdoors, a jogging stroller will hold up much better than a standard stroller will. Jogging strollers are much more durable, have larger tires and also tend to move much smoother all around. Many jogging strollers also tend to accommodate car seats with the purchase of an additional adapter, avoiding the need for a standard stroller and a jogging stroller as well. While jogging strollers have many pros, they also have their disadvantages. As previously stated, they can be very costly. They are also much bulkier, heavier and more difficult to load and unload. Jogging strollers with a swivel front wheel that can be locked into place while running are the better option because they maneuver better when used indoors. Families that have small cars or live in a small house or apartment may opt for an umbrella stroller. Umbrella strollers are smaller, lightweight strollers that fold compactly for easy storage. In the past, umbrella strollers had very little to offer, such as no recline, food tray, basket or cup holders. They also did not accommodate car seats so parents could not use umbrella strollers until baby was much older. In recent years, stroller manufacturers have appealed to parent needs for more compact, lighter versions of the standard strollers but also with the popular compact umbrella fold. One of the most highly rated is the Maxi-Cosi Perle. Umbrella strollers such as the Perle offer the umbrella fold but with all of the popular features parents like such as a large storage basket, cup holders, car seat adapter and recline. The less expensive umbrella strollers that do not accommodate car seats and cannot be used until baby is at least 6 months old are approximately $15-30 with the more elaborate umbrella strollers such as the Perle starting at $149 - $299. Prams are another option for parents when stroller shopping. Pram strollers use a bassinet instead of a car seat and can also be used as a bassinet for baby to sleep in if sold with a base. The more recent models of prams are also sold as stroller bases with the option to remove the pram and insert the toddler seat. These are the more economical option since babies tend to outgrow a pram by the time they are about 6 months old because they want to sit up and see the world as they stroll. The Inglesina Classica is a popular pram stroller but surely not an inexpensive one priced at about $700. It's easy to see from the many types of strollers described above that parents have many options when choosing a stroller for their baby. It's important to research not only the type of stroller that best suits your family but also the model, brand and style that suits your family's lifestyle. Many parents end up buying 2-3 strollers before their baby is even walking. Do your research and you will not only save money but also the much needed space you'll need for the many items new babies bring with them.